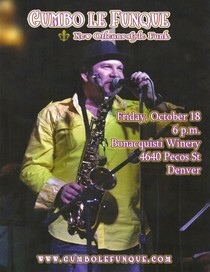 Join us on Colorado Winery Row for our free concert series featuring Gumbo Le Funque. Plus, food trucks Capt'n Crabby and Cake Crumbs Pastry Truck. Admission is free with wine for sale by the bottle and by the glass. Good times all but guaranteed. This is a free event with wine and food available for purchase. Bring a lawn chair. If parking lot is full, additional street parking is available along 46th and 47th Ave.
Wine Tasting for Two or Four at Ryker's Cellars (Up to 51% Off) Buy Now! Grape fermenting for #wine. Crush 2013. Taste what's inside the barrels this weekend at Ryker's Cellars. Congrats to Winery Row's Riker's Cellars for winning a Gold medal in the 2014 Governor's Cup. Join us for our free Friday night concert series on Winery Row this Friday, May 9th, with the classic rock guitar work of Heavy, Timbo & Deb plus food truck Capt'n Crabby. The event starts at 5:30 and admission is free with food and wine available for purchase. Bring a lawn chair and enjoy live music and wine from three Colorado wineries. This event is Rain or Shine. The parking lot fills fast but there is additional parking along 46th Ave.
Just finished barrel tasting for last time before we release our straight varietal wines. #PetiteSirah, #CabernetSauvignon, and #Merlot. Say Goodbye to 2015 with 15% Off Celebrate the New Year with 15% off any wine purchase December 30th or 31st. Click here for a free 15% coupon at Bonacquisti Wine Company! Come see us Saturday at the Highlands Farmers Market in Lohi (9-1), the winery (12-7), or the Castle Rock winefest (2-8). Tomorrow, Saturday 5-8, Colorado Winery Row will have the last Uncorked of the year to celebrate the holidays! Join us for some #wine!